As 22-year-old Katie McConnell descended 60 feet through the murky water of the Monterey Bay, she wondered if this would be another almost-blind dive. Then, as if by magic, the water cleared and McConnell looked up to see a raft of sea lions swimming above her. "It looked like they were flying around in a cloudy sky," said the 2012 marine biology major of her experience in UC Santa Cruz's scientific diving program. "It was amazing." That otherworldly encounter is what helped set McConnell on a new path and why the Merrill College student applied for, and won, a two-year job at a remote research station in Patagonia, where she will be assisting scientists with their projects. "I always wanted to grow up to be an astronaut," said McConnell, a surfer with sun-bleached hair who will leave for her new post this month. "But I think this is way better." Founded in 1972, UCSC's scientific diving program is a quiet but venerable part of the campus's research arm. Each year, it trains approximately 30 students to safely collect data in a world of strong currents, low visibility, and sometimes bone-chilling cold, all while wearing close to 70 pounds of gear. It can be tough, admitted Steve Clabuesch, UCSC's diving and boating safety officer who teaches the class. Still, it's crucial training for those who want to work in marine science fields. Offered in two sessions—a 16-day intensive in the fall and a quarter-long class in spring—the program drills safe-diving practices into students so the skills become second nature. It also teaches basic research techniques like setting out transects, counting specimens, collecting samples, and recording data on waterproof paper. It's an ability that may seem simple—until it has to be done in a moving ocean while wearing dive gloves and shivering from the cold, according to Clabuesch. The program trains people to be comfortable in tough conditions, to be able to concentrate on their task without forgetting safety techniques. In fact, this type of program began in the 1950s at Scripps Institution of Oceanography in La Jolla, Calif., after two graduate students lost their lives during research dives. UCSC students must pass both basic and rescue diving courses before they are allowed into the program. They begin their training in UCSC's pool, then move into the ocean. Their final test is a week-long camping trip to UCSC's Big Creek Reserve in Big Sur, where they are put through their paces in a sometimes forbidding sea. Kimberly Tenggardjaja, a 28-year-old ecology and evolutionary biology graduate student, said she struggled with the cold and with diving in low-visibility situations. But the skills she acquired helped her tremendously during two research expeditions to the northwestern Hawaiian Islands, a 140,000-square-mile Marine Protected Area that few are allowed to explore. She has now completed 180 dives. Like McConnell and Tenggardjaja, others in the program describe opportunities they found because of Clabuesch's connections and the skills they learned. Alex Wick, a slender 22-year-old who will graduate this year with a degree in marine biology, said his training helped him land a two-month job on a 135-foot research boat headed for Antarctica. 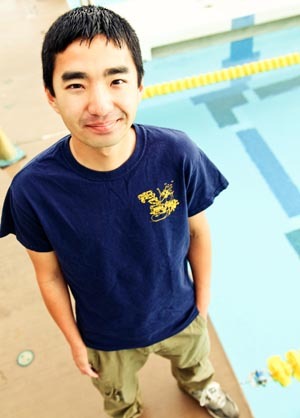 Ryan Yuen, 23 (Kresge '11, marine biology), said he uses his class skills for his work at the Monterey Bay Aquarium, where he taught an ocean-exploration program for 8- to 13-year-olds and now helps out in several of the institution's exhibits. Those who have taken the hands-on class agreed it taught them leadership, confidence, tenacity, and organization. Sitting in his neat office in the Ocean Health Building at Long Marine Lab, Clabuesch remembered watching a young woman struggle to swim across a kelp jungle to the dive spot during the program's final session at Big Sur. "She would literally be in tears as she put on her mask but she did it for three days. She didn't give up," Clabuesch said. "That's one thing these kids figure out: If you're persistent you will succeed."